Lawrence Brunoli, Inc. is a company dedicated to providing high quality and personalized service to its clients. We are a full service construction company based out of Farmington, Connecticut. Lawrence Brunoli, Incorporated was established as a General Contractor in 1987. Since that time Brunoli has completed a wide range of construction projects for various Federal, State and Municipal agencies. These projects have included schools, hospitals, water-treatment plants, correctional facilities, parking garages, police stations, university buildings and athletic complexes. Lawrence Brunoli, Inc. is a family business and is owned by Lawrence J. Brunoli, CEO, Lawrence Brunoli Jr., President and Daniel Neagle, Vice President. Unlike many other General Contractors, the principals of Brunoli are intimately involved in their projects. Additionally, Brunoli is a “true” General Contractor and self performs much of the work with its own forces. Brunoli has the expertise, manpower and equipment to execute site work, demolition, concrete work, carpentry and a multitude of other trades. Brunoli also possesses the required expertise in complex project management, CPM scheduling and coordination. Brunoli is prequalified by the State of Connecticut Department of Administrative Services to perform Complex General Building Construction, Concrete, General Trades and Construction Management. Brunoli maintains a State of Connecticut Department of Consumer Protection Major Contractors License and is prequalified by the State of Connecticut Department of Transportation. Brunoli also qualifies as a Small Business Concern according to Federal guidelines. Brunoli is also prequalified by the Commonwealth of Massachussetts DCAMM to perform General Building Construction. Project limits are $25 Million for Single Project Limit and $50 Million for Aggregate Work Limit. Lawrence Brunoli, Inc. also provides an array of services ranging from general contracting to construction consulting within all sectors of the construction industry. Our complement of services meets a broad range of customer needs. We utilize the most recent advances in construction software and technology, employing state of the art methods and materials to deliver project quality and customer satisfaction. Lawrence Brunoli, Inc.’s belief is in dedication to the customer. We work diligently to best understand the needs of our customers and supply a product that is of high quality and a service that is of great satisfaction. 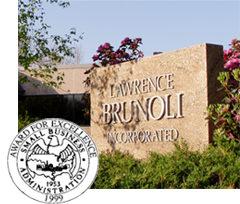 Lawrence Brunoli, Inc is an Affirmative Action/Equal Opportunity Employer. See some of our featured completed projects, click below.